A fascinating discussion with sound artist Richard Garet speaking on the first major exhibition on sound art in New York last year entitled “Soundings: a contemporary score” by critic / sound artist Esther Bourdages (QC). 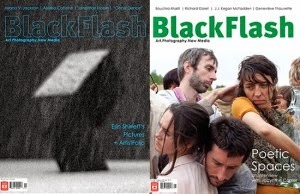 Blackflash Mag, issue: 31.2 on newsstands May 2014. Esther Bourdages: According to the historian of media arts and experimental music, Douglas Kahn: “Comparing the artistic utilization of the mechanical recording of the objects of the two major senses, that is sight and hearing (what John Cage calls the public senses), we can note a remarkable historical lapse: approximately 100 years between the eyes and the ears….” It took a while for sound to gain independence from the image, becoming an artistic form in its own right. Whether in performance, music composition, photography, installation, moving images, or as a signal to generate sound and/or images, sound is at the center of your practice: it is the major component. Do you consider yourself a sound artist first? Richard Garet: I think that I consider myself an artist, a contemporary artist, whose work utilizes sound at its core. Rather than distinguishing between whether sound or visuals are the most important thing I would indicate that, for me, time is the most sensitive thing. My pieces are time-based and even when they reach complete stillness time is still very present. Also my pieces range from total immateriality to material form depending on the work, and that changes the focus too. Especially if the work is also comprised of visual elements that are orchestrated and articulated within the work. Also there are at play elements of interdisciplinary approaches to media, and a wide range of media sources are involved from analog to digital. However, if someone calls me a sound artist this is accurate too, but I find the term somewhat limiting and boxing… I prefer to be seen as an interdisciplinary artist.